In 1980 I watched the Roberto Duran vs Sugar Ray Leonard fight at Madison Square Garden in New York, which was beamed in from Montreal, Canada. There was a live card at the Felt Forum in the same building. One of fights that night was between a young Welterweight named Jimmy Longo who fought a draw against a guy named Blas Dechamps. it was a well fought four round Draw. I remember the night well and the good friends that were with me. Duran beat Leonard and won the Welterweight Title, it was a great night. When I walked into Jimmy Longo’s Shoe Store a couple of years ago I realized a couple of things right away. That Jimmy Longo is from New York, is an Italian-American and a former boxer. So naturally we hit it off and we talk boxing every time I go to his shop.In our discussions he told me about how he trained at the Huguenot Boxing Gym, in New Palz, New York which was Floyd Patterson’s Gym. 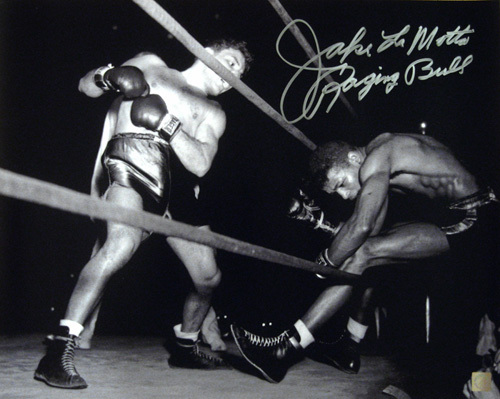 Patterson was Olympic Gold Medalist in 1952 and was heavyweight Champion of the world from 1956-1959 and from 1960 to 1962. Jimmy also told me how he knew legendary Trainer Cus D’amato and meet a 12 year old Mike Tyson among many others. Jimmy finished with a 11-7-1 record as a professional and had fifty amateur fights as well. He knows his way around the ring, that’s for sure. After his last fight, Jimmy became a teacher and coached several sports teams at a High School in New York. After a “disagreement” with school officials he moved to Florida thirty years ago and opened his Shoe Repair Store and has been a Cobbler here in Jacksonville all these years. Jimmy is an interesting guy and a good man, He has been a fighter all his life too. Recently he told me that is his mother passed away when he was just a kid, and he and his five brothers and sisters were ultimately packed off to an orphanage in New York. It’s no wonder he found boxing, where everything depends on your own ability, it’s all on you.Jimmy’s Shoe Store is on 3rd Street/AIA here in the Jacksonville area, he will be closing the shop soon after all these years. You see, this generation doesn’t want to repair shoes anymore. It’s a throw away society we live in today. But Jimmy Longo is keeper. Thanks for sharing your story Jimmy. Written By: Al Iannacone Sr.
Al, after getting this email I typed your email ver batim on some real nice paper. My wife drew some boxing gloves on it and put it in a frame. I just got back carrying it to Jimmy. I thought he was going to cry. He just loved what you wrote and seemed so proud. I live here in PV 7 months a year and in Cape Breton the other five. It is rare here in PV that I find someone goes all out to tell good things about others. I guess I mean that even finding people that care about others unless they are wealthy is rare. In Cape Breton it isn’t rare. Thank you for taking your time talking to Jimmy and for taking your time to send out the email. I have been thinking about coming to your gym but at 75 I am afraid I would be in the way. I still lift weights pretty heavy three days a week and really still enjoy doing so. Don’t know why I do it except that maybe when I go to the Old Age Home I will have the biggest guns in the place. I thank you and Jimmy thanks you. I can’t tell you how much it meant to him. Pat, Jimmy is a good man. And he has a good friend you. You wouldn’t be in the way at all. Stop by some time. Saturday is usually a good time to go. I do need to stop by and see Jimmy. I am really glad he liked the story. Pat,I to want to thank you for your kind comments. And tell you how thoughtfull it was for you and your wife to type the story,print it out, draw the boxing gloves and frame it for Jimmy. Thank you.